They are cheesecake stuffed strawberries, drizzled with a chocolate glaze! We made a few extras to sample at home and they are absolutely amazing. Granted, we didn't even let them set before sampling, but they did set well. Hull a dozen strawberries with a small sharp knife. Using a baby teaspoon, lightly scrape the insides to make a nice hole for the cheesecake, but do not cut through the sides. Blend 1/2 brick of softened cream cheese, 1/2 container of whipped topping, 1/4 cup of sugar, and a splash of vanilla, until mixed well (I used a hand mixer). Using the very small spoon, slowly scoop cheesecake into each strawberry till just filled. Set in the fridge for at least 2 hours (I set mine overnight to be safe, since the strawberries were the "crust"). After cheesecake is set, melt a little chocolate to drizzle over the tops of the strawberries. Chill to set chocolate. ***My note - Next time, I may try dipping the bottoms of the strawberries in chocolate first, to firm up the base. I thought of this *after* I had already filled them with cream cheese, so no such attempt could be made this time. I also borrowed the egg carton presentation idea from another bookmark of mine suggesting using it to gift mini-muffins. It showed options for decoration it in scrapbook paper, which I still do want to try sometime. This time was all about making sure the strawberries worked. Congratulations! I've awarded you the Versatile Blogger Award! 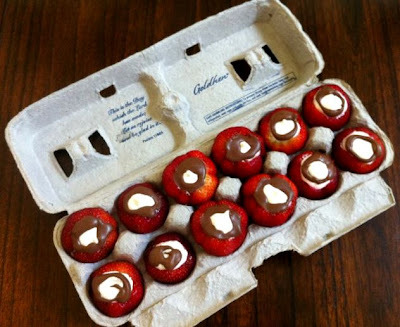 I just made these for my hubby last week, but I never thought to put them in an egg carton. I love this! It is perfect for the 4th too. Thanks for sharing this. I will be bookmarking and Pinning this one for sure. Visiting from WFMW. Nice to "meet" you. Enjoy the rest of your week. These sound amazingly good! I think I'm Going to make some for my Dad's birthday party this weekend! I would love if you linked up to Make it for Less Mondays @ Simply Cadence! Oh these look way too good!! Need to try these! It might be easier to place filling in a baggy, snip a corner and squeeze the filling into the strawberries. Great idea. I'm wanting to try these for a party. How far in advance can I make them without them getting gross?